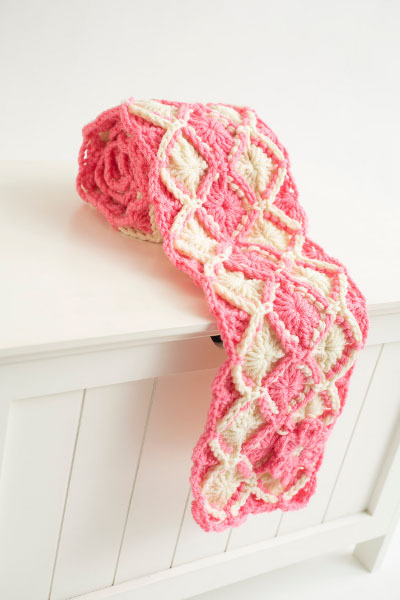 Bright pink and subtle cream tones work together to create this one-of-a-kind scarf. Make it for your daughter, granddaughter or special young lady in your life. Cluster Treble Crochet (cl tr): Holding back last loop of each stitch on hook, 3 trs in place indicated, yarn over, pull through all loops on hook. Back post treble (bptr): Yarn over (yo) and insert your hook from back to front between the posts of the first and second double crochet in the row below, and then from front to back again between the posts of the second and third stitches. Yarn over and draw the yarn through the 2 loops on the hook, twice. Large Shell (lg shell): (4 tr, [ch 1, 4 tr] twice) in place indicated. Small Shell (sm shell): (4 tr, ch 1, 4 tr) in place indicated. 4-back post treble decrease (4-bptr dec): Holding back last loop of each stitch on hook, bptr around each of next 4 stitches, yo, pull through all loops on hook. 8-back post treble decrease (8-bptr dec): *Holding back last loop of each stitch on hook, bptr around each of next 4 stitches*, skip sc between shells and working on next shell, repeat between * once, yo, pull through all loops on hook. The 8-bptr dec is always worked using the last 4-tr group of 1 shell and the first 4-tr group of the next shell. When working into beginning ch, insert hook under top two loops of ch to avoid stretching the chain and leaving a large hole. Rnd 1: With aran and G hook ch 3 and form a ring, 6 scs in ring, join to beginning sc and fasten off. Sew flower to scarf as shown on photo. 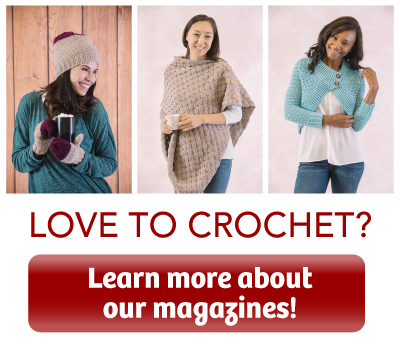 Do you have any tips on crocheting shells? Share below! Not really a tip but if the row after the shells is worked into the centre of the shell I’ll adjust the stitch count to an odd number so that it lines up better. I love the texture of this scarf. 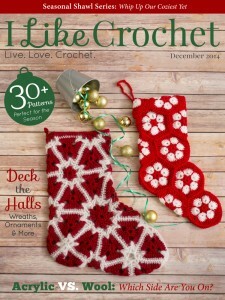 They need a bit of practice – make a good size sampler and then crochet a simple shape, before tackling anything with a lot of shaping. Thanks for the free pattern. I have no tips. I just learned the shell stitch for a purse I did and haven’t used it since. But I’m excited to try it again on this scarf! Thanks for the pattern!! I don’t have any tips- but I love shells! Sorry, didn’t see the question… tension and keeping counts. Otherwise, I like them, fairly easy and work up quick. Nope! I wish my great-grandma was still here, because I’d bet she would have some suggestions! Practice, and don’t beat yourself up while learning something new. I do not have any shell tips. Keep good tension and count your stitches. Nice looking. Tips? Shells aren’t hard or complicated. Just follow the instructions in the pattern. no tips, but it would teach me a new stitch. Count twice to make sure you get the right number of stitches in each shell. Take a look every once in a while to see if you spot an error. I hate to have to rip back to the beginning of the previous row because I found a mistake while working the end of the next row. As others have stated, watch your tension. I have no advice, but I do need to work on my tension on shells as I am putting too much on. Oh well, I’ll learn..
No tips, but like the pattern. Think I’d do it in a different color, though. I’d suggest keeping consistent tension and stitzh length. Just to keep an eye on your tension so the first & last are the same size. Can be difficult when making shells with a greater number of stitches in each one! I quite new to crochet so I don’t have any tips. I’ve enjoyed making them and think they tend to be rather easy. Great tip above about maintaining tension. No tips from me except learn them and enjoy! I don’t know that stitch, but would like to learn. I count my stitches like mad when I do shell stitch! I’m still pretty new to crochet, so I don’t really have any tips to crocheting anything, much less shells, yet! I do find that mine seem to be best when I try to make them a little tight. Shells ask that your stitches be consistent so they can lay nicely together and look like a shell instead of ragged work. I think they’re a lot of fun, regardless of how many stitches are required to make them. I think the most important tip for crocheting shells is to keep the same tension as much as possible so you don’t have some bigger and some smaller. Also practicing with some shells before you begin will help get the kinks worked out before you start your masterpiece!